A few years ago my parents had a bumper crop of crab apples and my Mum turned the knobbly, gnarly fruits into a beautiful pale pink jelly. Not the children’s party sort, but the kind that you have with cheese or use to rescue a gravy. She’s good at preserves, my Mum; I like to think that she was trained by my Nan, but I don’t actually know if that’s the case. Despite years of practice as a kid, my jams, chutneys and marmalades are usually terrible, more akin to polyfilla than anything else. But I feel it a case of domestic pride, a nod to my feminine heritage, to never give up. Also, I bought a sugar thermometer, which changed everything. (No more messing around with wrinkle-tests and saucers in the freezer!) 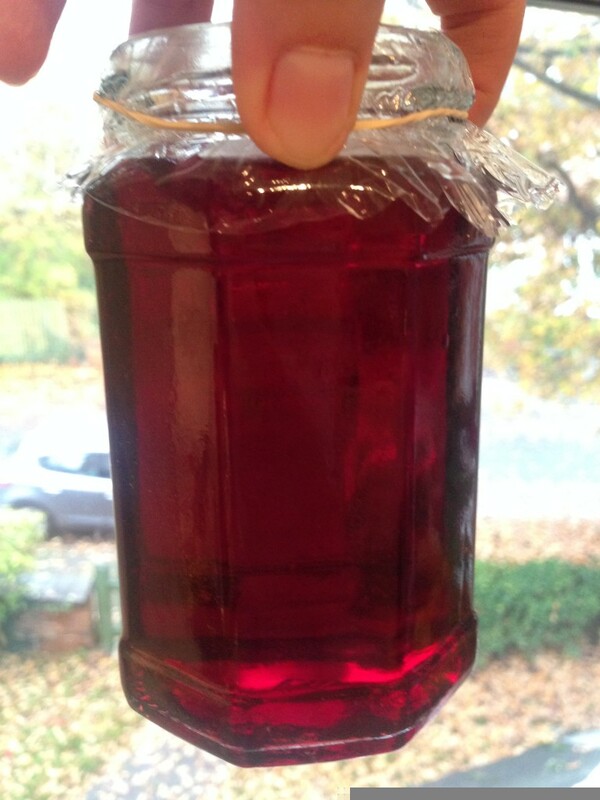 So I made a batch of sloe apple jelly and you know what, it’s pretty darn good! This is a beautiful, jewel-coloured concoction, its sweetness masked by the ripe tannins of sloes. It’s a bit like a set sloe-gin. You could have it as it is, with cheese, use as a glaze for lamb or game, or to add sweetness to a stew or sauce. The next thing is to get all the kit together. Jellies need straining, which you could do using a square of muslin set over a sieve…or you can use a proper, old-fashioned jelly bag. 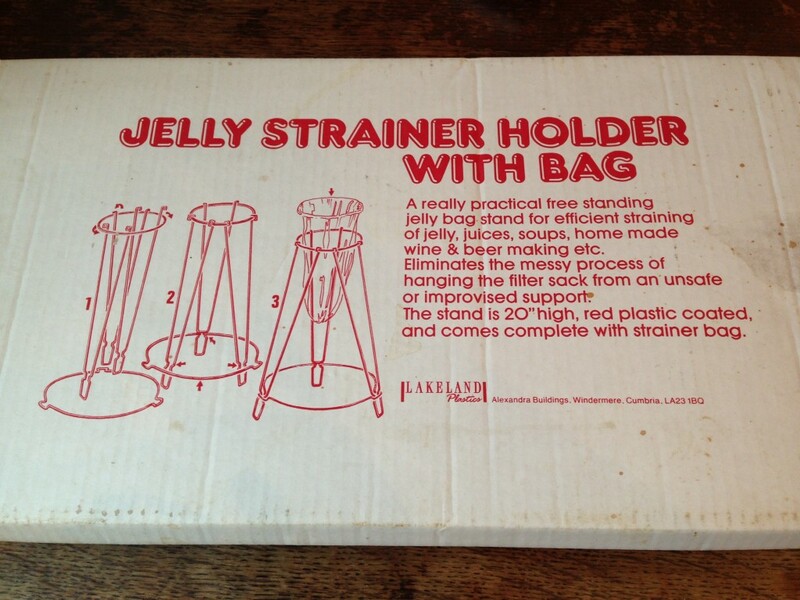 This jelly strainer kit usually lives under the stairs at Grove House (my parent’s house) and despite using it regularly for my 35 years, it still takes ages to successfully put it together. I got there in the end. 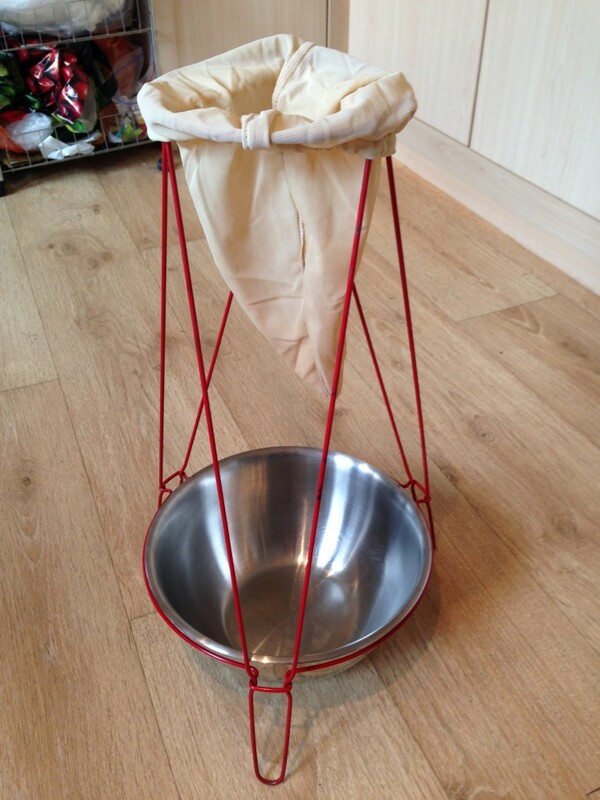 The other essential bit of kit is a preserving pan. Ours – another sturdy 1970s heirloom – has a really wide base, which makes for a large surface area and helps the mixture to reduce and get to temperature quickly. 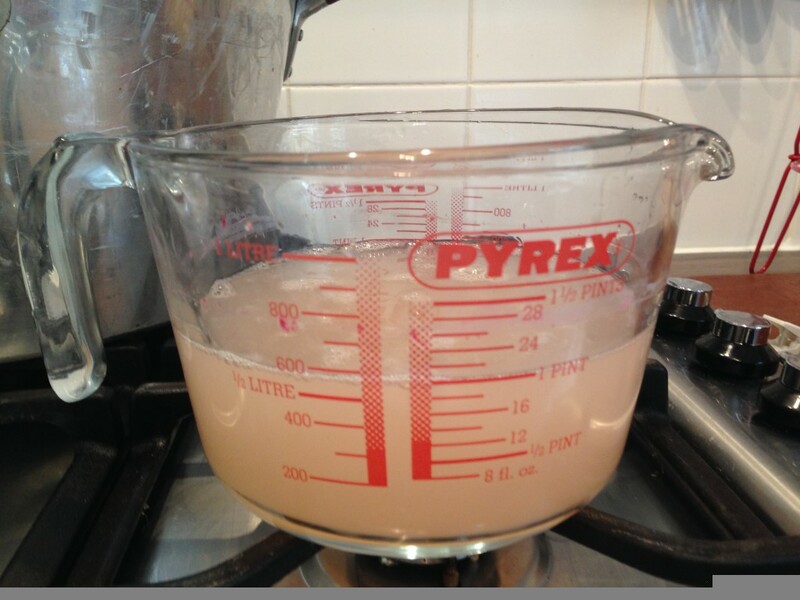 Whatever you have, use the biggest pan possible – hot sugary liquid expands in volume and you don’t want it boiling over. Sloe apple jelly needs sloes and apples. 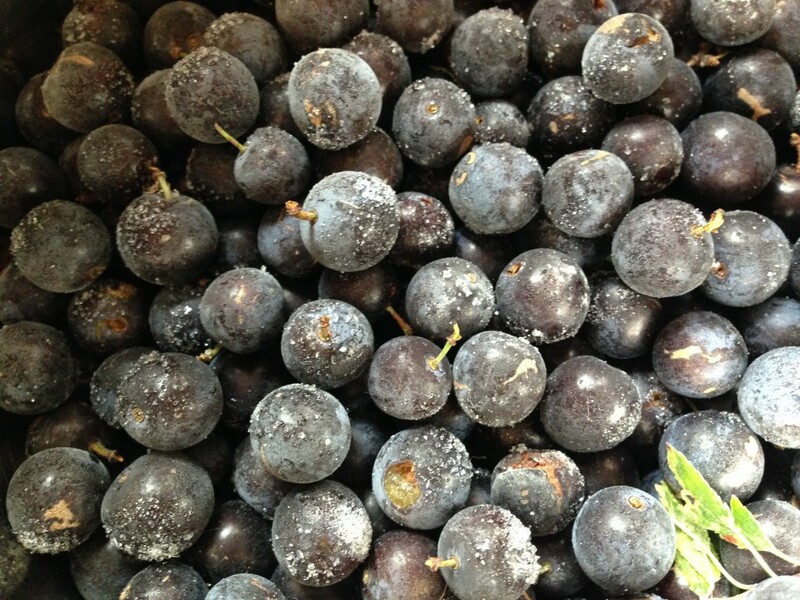 These sloes were picked from Castlemorton Common back in August and have been hanging out in the freezer since. 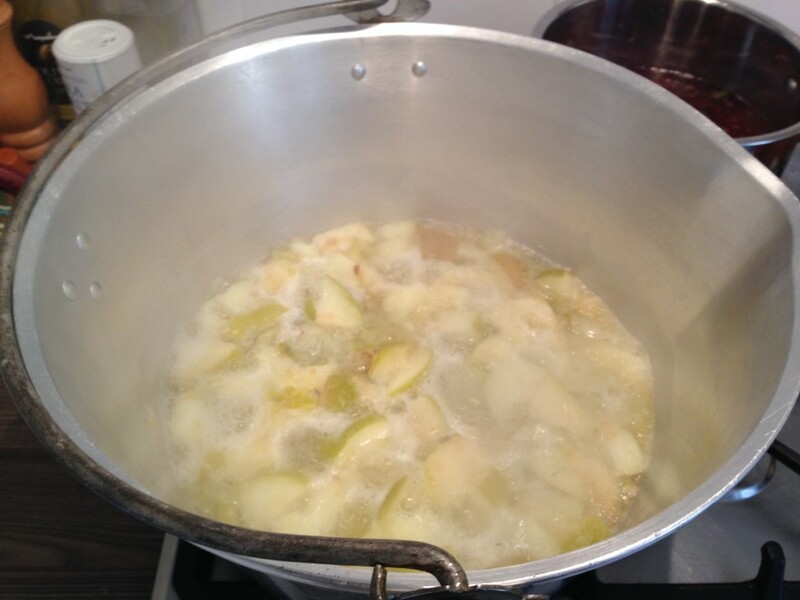 The apples are bramleys, roughly chopped but with the pips and skins left in – that’s where the pectin is, and pectin is what will set our jelly. In separate pans, cook each fruit with just enough water to cover, until soft – about 10 minutes. Now for some fun. Each mixture has to go through the jelly bag separately: for our contraption, this means ladling the cooked fruit into the bag one spoonful at a time, hoping that the whole thing doesn’t collapse and flood the kitchen with sticky purple juice. Just let the juices strain through the bag at its own rate – don’t be tempted to squeeze or push it through, else you’ll get a cloudy jelly. 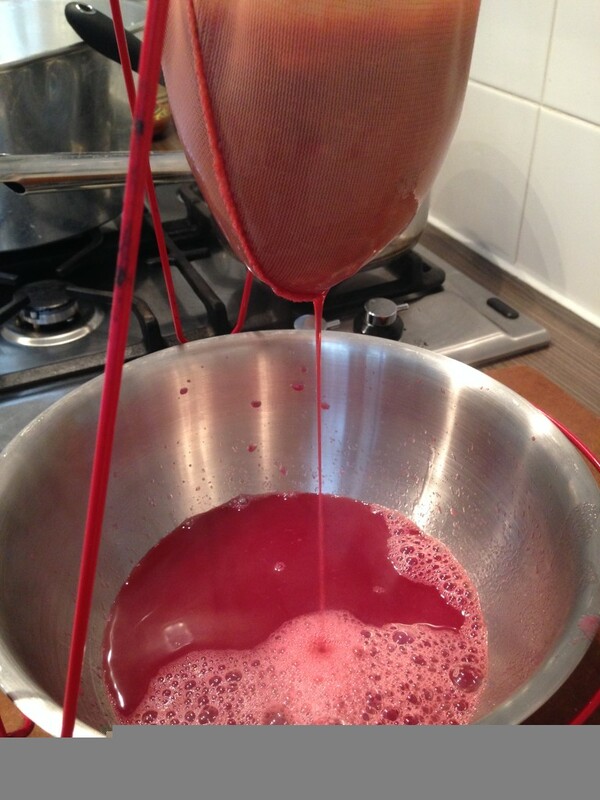 Now take equal quantities of the sloe and apple juice, and slosh them into the preserving pan. There’s one more ingredient to go: sugar. We need 450g sugar for every 570ml of juice. All preserving recipes say to gently warm the sugar in the oven before using; I don’t really understand why we do this, but everyone says we must, so who am I to argue. Add your measured warm sugar to the waiting juices. Gently heat the mixture to melt the sugar, then bring to a boil. A sugar thermometer helps here – boil until the mixture reaches 105 degrees celcius, which takes about 20 minutes. 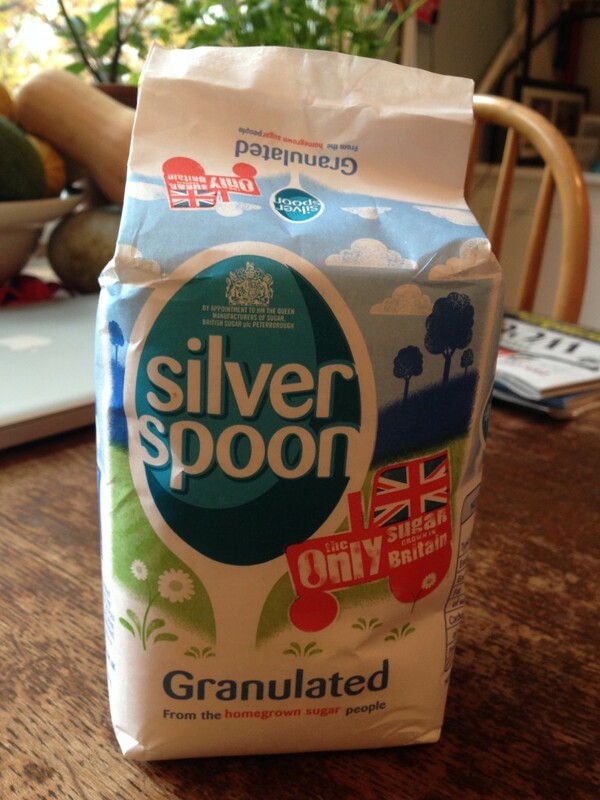 There will be lots of impurities that rise to the top – remove them with a slotted spoon. Bring the mixture to the boil, skimming off impurities as you. It needs to get to 105 degrees celcius. Once the jelly has come to temperature, allow it to sit for five minutes to cool slightly, then decant into your waiting jars. Cover with waxed paper and a lid, then leave to cool completely. 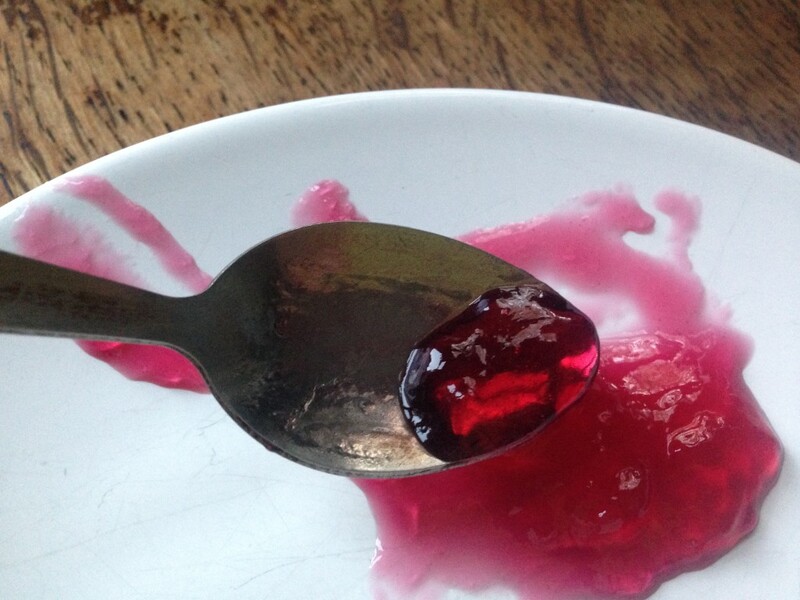 This is a loose-set jelly, which I prefer as it feels fresh and more contemporary than the super-solid jellies of old. It’s a glorious colour, but has a really grown up flavour – those tight tannins from the sloes stop the jelly from edging over to sickliness. It’s a good addition to the autumn preserving repertoire. Recipe adapted from Sarah Raven’s Garden Cookbook, p324. This recipe made me 3 and a half jam jars. Wash and sterilise the jam jars. Warm the sugar packets in a very low oven for 30 minutes or so. Get the jelly straining bag ready. 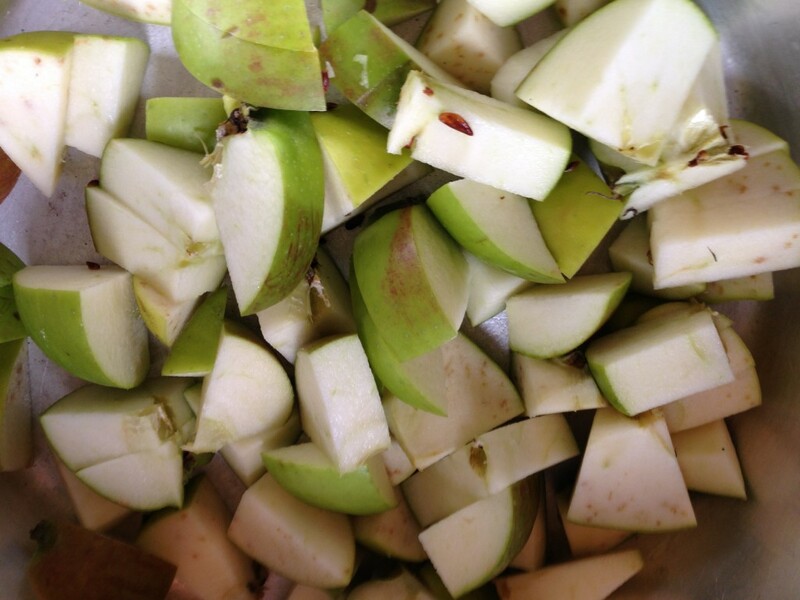 Chop the apples, keeping the pips and skins, and cook with enough water to just cover until soft. Separately, cook the sloes with enough water to cover until the skins burst. Put each fruit through the jelly bag separately. 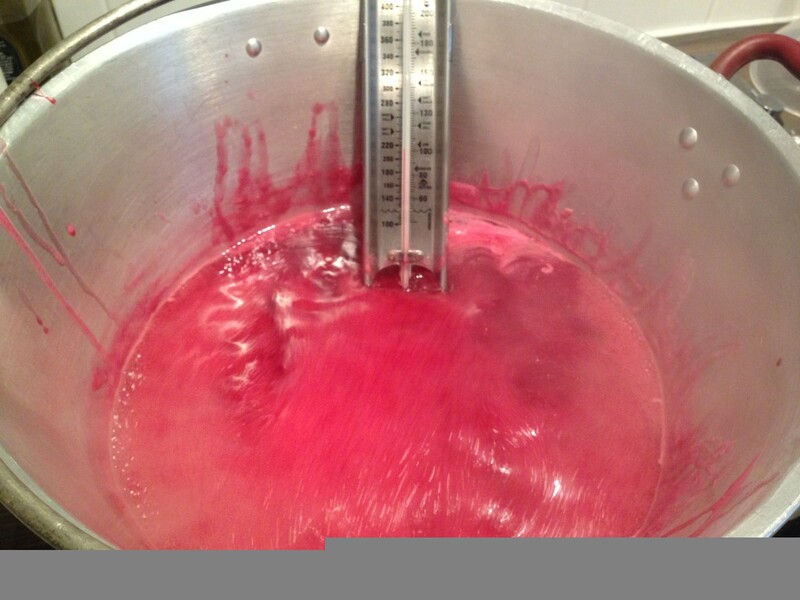 Measure equal quantities of apple and sloe juice and put into a preserving pan. 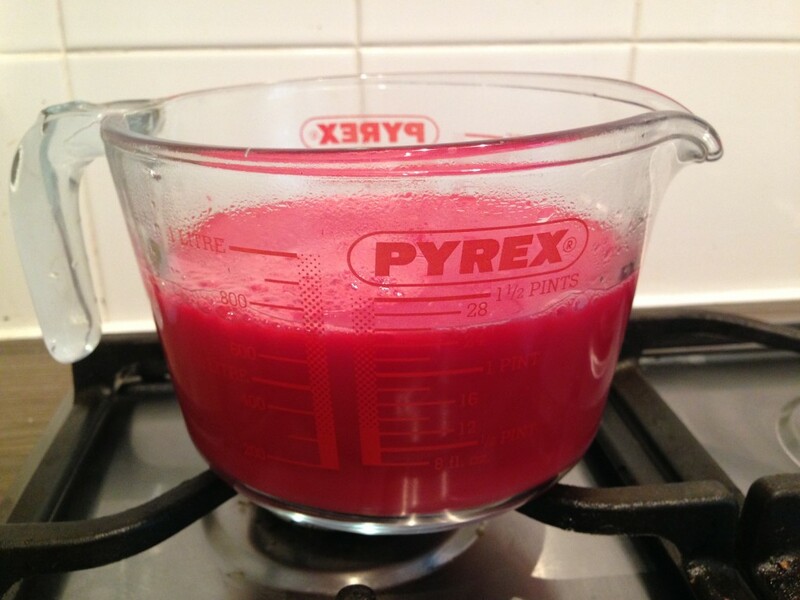 Add 450g of the warmed sugar for every 570ml juice. 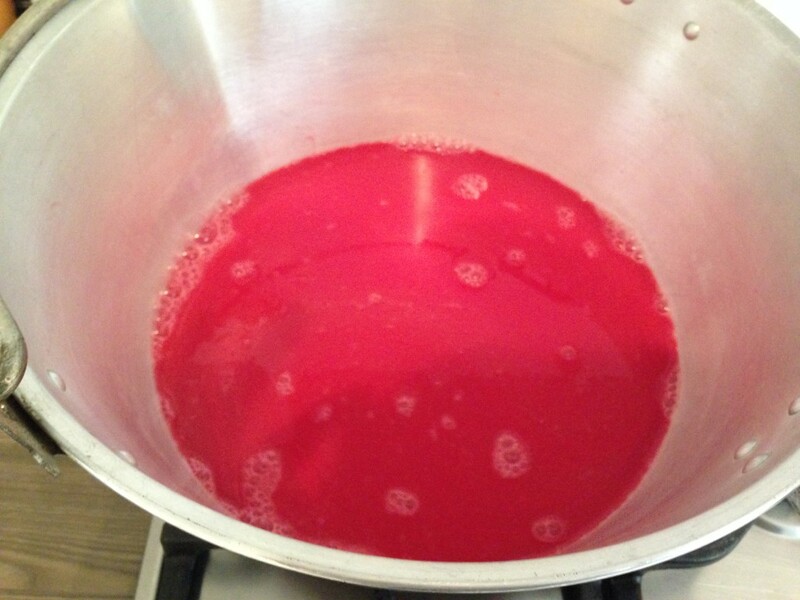 Stir on a gentle heat until the sugar dissolves, then bring to a boil and cook until the mixture reaches 105c. Remove any impurities with a slotted spoon. Once it’s at temperature, leave to stand for five minutes then decant into the prepared jam jars. Cover and seal. 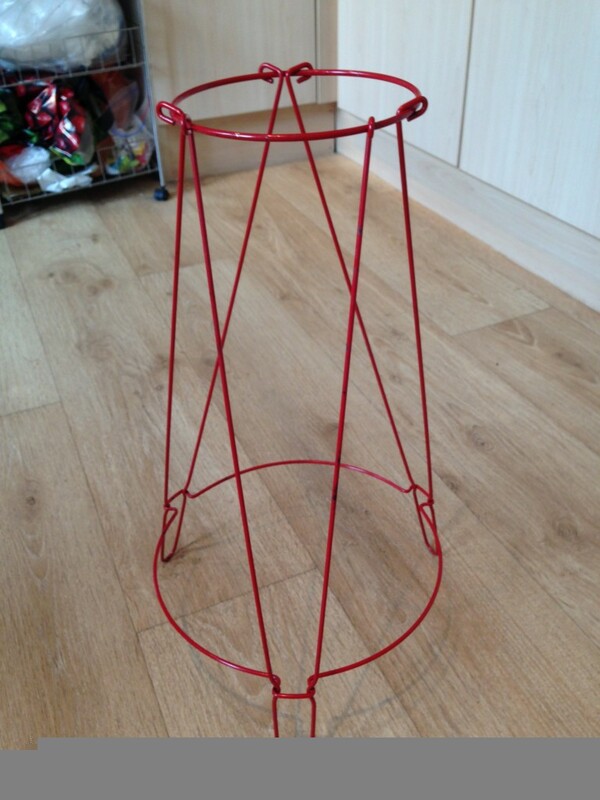 Keeps well for several months. This entry was posted in Recipes, Sweet and tagged preserves, Sarah Raven, sloe apple jelly. Bookmark the permalink.